Look for leaks under the generator. You might avoid an expensive problem by fixing a leak early. 2. Be sure the AC load breaker or switch is turned OFF when starting the generator, warm it up for a minute, then connect the load. When you shut down the generator, turn the breaker or switch OFF, let the generator cool down for a minute and then shut it off. This could prevent expensive failures of the automatic voltage regulator or generator diodes. 3. Turn OFF the shore power breaker at the dock before switching the generator on if you start at the dock. If the shore power switch is wearing out, the generator could momentarily or permanently connect to the shore power with catastrophic results. 4. Change the seawater pump annually before you start your cruising season. Throw away the old one or keep it for a spare if it looks good. Using silicon dielectric grease on the new and old impeller to make will make them much easier to remove and install. 5. If you don’t put a lot of hours on your generator, change the oil and filter twice a year (spring and fall), change the fuel filter annually and service or replace the air filter annually. Northern Lights generators incorporate washable air filter. Replace them only if the foam seems to be deteriorating. 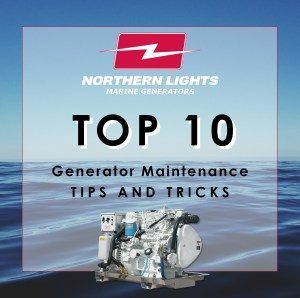 If you are building up a lot of hours quickly on the generator, then follow the manufacturer’s maintenance recommendations. 6. You can prevent dirty exhaust! Try to maintain 40 – 50% of the generator’s rated KW load or more at all times. Light loads are perfect for your inverter; heavy loads are perfect for the generator and it will run more efficiently. Light loads will cause the exhaust elbow to plug with carbon, causing performance problems, smoke, overheating and failure of the elbow. 7. Inspect the exhaust wet elbow visually once a year. If you seen any visible signs of distress, like rusty spots, leaks or cracks, replace it immediately before it causes seawater failures of electrical parts on your generator. 8. If your generator has zincs, inspect them every 90 days until you know how often they need to be changed. Note: Northern Lights generators up to 20 KW don’t require zincs! 9. Always carry spares for your generator. At minimum, carry two spare fuel filters, one spare belt, one spare oil filter, spare oil and spare coolant.